DONG Energy has announced it has acquired the Hornsea offshore wind development zone, as well as the project rights to Hornsea Project Two and Three. Earlier this year, the Danish energy giant announced that it had acquired the Hornsea Project One offshore wind farm development from the SMart Wind consortium. DONG Energy announced Friday that it had completed the acquisition of the entire offshore development zone from Mainstream Renewable Power and Siemens Financial Services. DONG Energy also acquired the project rights to both Hornsea Project Two and Three, which together have up to 3 GW worth of offshore wind potential — on top of the existing 1.2 GW set to be developed as part of Hornsea One. 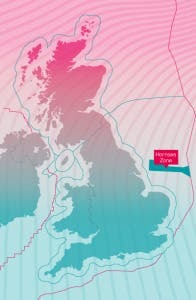 The Hornsea zone, located between 31 kilometres and 190 kilometres off the Yorkshire coast of England, and spreading out over 4,000 square kilometres, makes up one of the world’s largest offshore development zones, and are set to form part of DONG Energy’s post-2020 project pipeline strategy. “Today’s announcement underlines our strong commitment to helping the UK deliver low carbon energy supplies while creating jobs and building a strong local supply chain,” Leupold added.